Facebook Messages is a new feature and service within Facebook that combines SMS text messaging, IM instant messaging, chats, emails and regular messages. 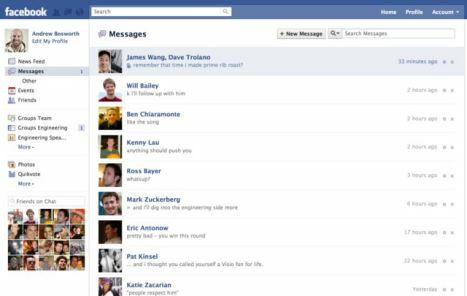 Facebook Messages was codenamed Project Titan, and include a @facebook.com email address with privacy settings similar to those of other Facebook services. With Facebook Messages, all chats, SMS texts, emails, and Facebook messages sent and received will be combined and integrated into one Messages interface as a central place of control. Messages are grouped into one ongoing conversation with each friend or group of friends, not by date or subject line. Though Facebook Messages users can create an email address which ends with @facebook.com domain, Facebook stressed that Messages is not email. There are no subject lines, no cc, no bcc, and you can send a message by hitting the Enter key. Seamless one-stop messaging and integrated communication – Facebook messages, chats and texts all in the same place regardless of what user is using to communicate (Facebook web interface, Facebook app, mobile or email). Friends will receive message through whatever medium or device that is convenient for them, and you can both have a conversation in real time. Conversation history – All of messages with someone will be together in one place, whether they are sent over chat, email or SMS. Everything discussed with each friend is shown as a single conversation. The Social Inbox – Inbox will only contain messages from your friends and their friends. All other messages will go into an Other folder for checking separately, with ability to bounce any emails that aren’t exclusively from friends. Faster interaction – Send messages just by hitting Enter key. Smart filtering: User will always see what’s important to he or she first – messages from the people he or she is close to take precedence over mailing lists. Adding people to group conversations: Loop new people into the conversation, giving them full access to everything that’s been said so far. Forwarding: Pass individual messages along to other friends. Unsubscribing, or removing yourself from a conversation: Leave a group conversation when you no longer wish to receive new messages. Sending attachments: Attach external files to your messages in addition to sending links, photos and videos. Facebook Messages are compatible with traditional email systems (e.g., Hotmail, Yahoo or Gmail) with receiving and sending external e-mails capability. 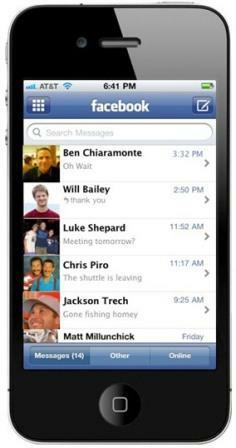 The Facebook app for iPhone will also be updated with a new version which integrates the unified Facebook Messages feature. 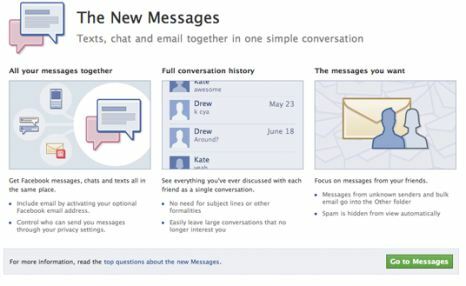 Facebook Messages currently requires an invite in order for existing Facebook users to upgrade. To request for an invitation, go to official Facebook Messages page at http://www.facebook.com/about/messages/ and click on Request an Invite button. Alternatively, just ask for or look for invite from friends who already joined and registered with the Facebook Messages, where there will be “Invite Friends” link at the bottom of Messages view to send a limited number of invitations. Once an invite is received, either from Facebook or friend, user can click on Go to Messages to start activating and using the Facebook Messages, and optionally, to to set up a free @facebook.com address by clicking the Claim your Facebook email” link on Messages view. The Facebook email address will match user’s public username, which means if you have a profile URL of “facebook.com/username”, the Facebook email address will be “username@facebook.com.